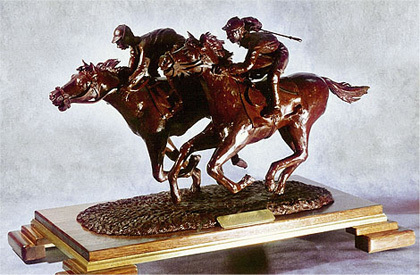 Competed and won 15 gold medals (most with distinctions) at major international competitions. Twice awarded as MOST OUTSTANDING ARTIST (SWITZERLAND 1997) and MOST OUTSTANDING PASTRY CHEF (SINGAPORE 1990). 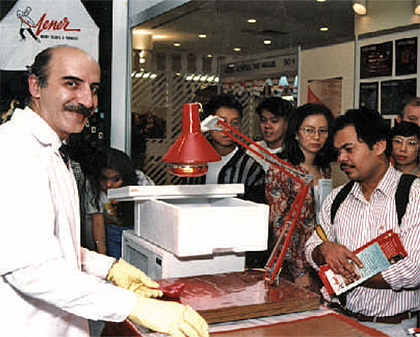 Serdar Yener’s masterpieces are displayed in museums at Champagne FRANCE, Culinary Art SWITZERLAND and National Museum of SINGAPORE. 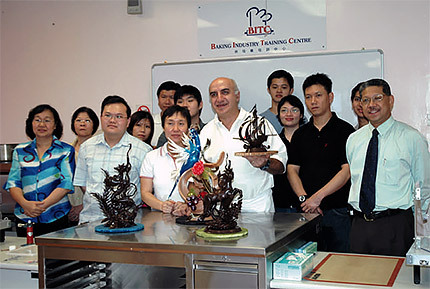 Trained more than 400 local and abroad students in SINGAPORE, YENMART PASTRY ART Gold Coast, TAFE COLLEGE Gold Coast and TAFE COLLEGE Brisbane. 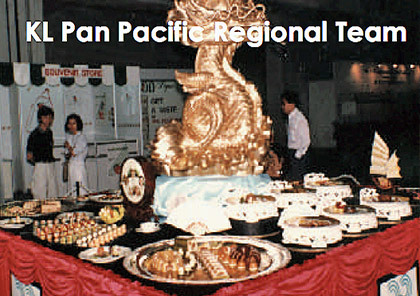 Has judged in major culinary competitions in MALAYSIA, SINGAPORE, AUSTRALIA and World Pastry Championships USA. 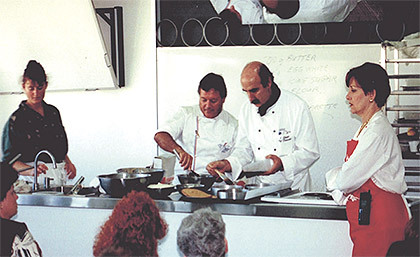 Invited on many occasions to different countries to give seminars and demonstrations on sugar and chocolate work. 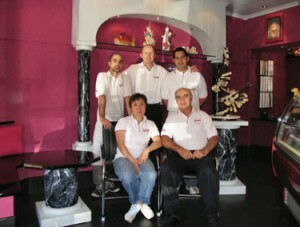 Has coached young pastry chefs, regional and national teams in multiple international competitions. More than 300 articles written about his work in international newspapers and magazines. 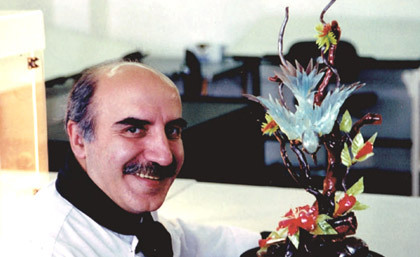 His custom designed cakes and showpieces were purchased and presented to many celebrities and government personalities which includes Richard Clayderman, Pink Floyd, David Copperfield, the Sultan of Brunei, Malaysia and the King of Oman as well as the Turkish Prime Minister and Presidents. Married with 2 children and 4 grand children. 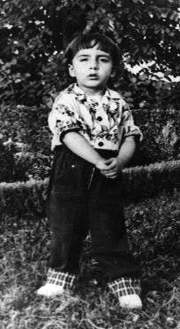 I was born on the 28th of November 1952 in Istanbul, which is one of the most populated cities in the world. Today, over fifteen million people live in this historic city of Turkey. As far as I can remember from my childhood days and some of my family photos, my father’s family was quite wealthy. The white house with two stories and ten rooms where we lived was surrounded by all sorts of fruit trees and it was the landmark of the small town called Bakirkoy, which today has become a very busy town in the giant city. 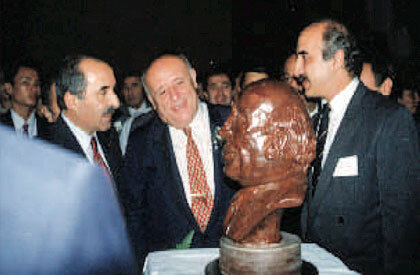 My grandfather was the owner and founder of a factory, which supplied road construction materials, and he became rich during his time when Turkey started building the city’s highways in the 1950’s. Unfortunately, after my grandfather’s passing, neither my father nor his siblings had the interest to carry on with his legacy. I had an ordinary childhood life with lots of self made toys like wood carved guns and galvanised wire trucks. I could still remember the football matches my friends and I had on the dusty streets whenever it was free of cars. Not to mention the wooden scooter I made with ball bearing wheels. Me (middle) having dinner with family. In 1959 when I was just seven years old, our beautiful house was burned down and everyone in my family had to move to another town call Sisli. As a result of that, I had a complete change of environment, school, friends, hobbies and activities in such a short time. Whenever I had a few coins to spare, I always indulged myself in those delicious mouth-watering finger sponges from the corner pastry shop, not knowing that I would be baking the same sponges in huge quantities in years to come. During this time, there was no television at home but through the cinema movies that I frequently watched growing up over the years, I learned that there’s a world outside which I would like to visit one day. I have never excelled well in subjects like maths and history at school, and I can never remember names and places, but remarkably, geometry and physics that involve shapes, lines and creative thinking was a breeze for me. 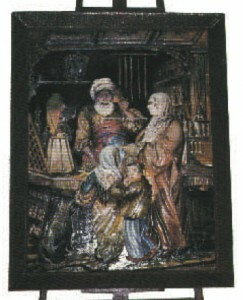 Obviously, I inherited my natural talent from my father Sadi Yener who was an amateur painter and my older brother Derya also showed great artistic abilities. When I had to repeat 11th grade as my results got from bad to worse, I asked my mum, Suhendan Yener to find a job for me. Her first choice was Istanbul Hilton, for she knew the director of finance, Ekrem Colakoglu who rented an apartment from us. That was the day of my life time encounter with the pastry world. Mr Colakoglu sent me and another boy (with the same intention as me) to the chief cashier Enis Tekin. I can never forget that particular moment when Mr Tekin pushed his glasses up, pointed his finger at me and said “You go to the pastry kitchen!” and to the other boy he said, “You go to the Rooftop Restaurant”. 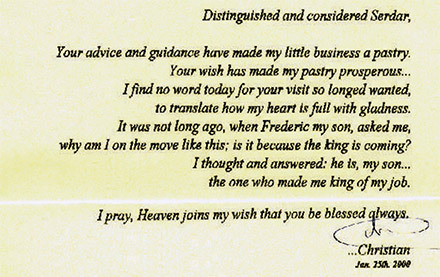 With those few words, he paved my life time career for me as a pastry chef. I didn’t know anything about pastry then; thus it was the beginning of my profession. 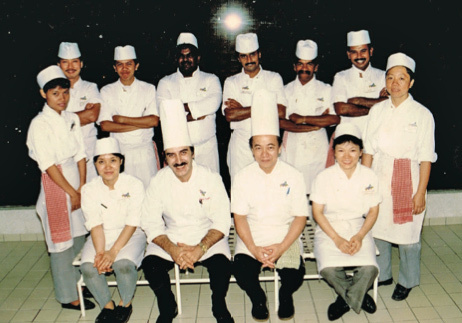 I started my career as a trainee outlet controller and I was stationed in an enormous pastry kitchen with 25 staff. Whenever the mixer machines were on, I felt like I was working in the engine room of a cruiser ship. I was 17 years old then and each day, sitting behind my desk, I had to count and record every bit of dessert, ice cream, bread and pastries into an inter-kitchen transfer form before they leave or return to the pastry kitchen. 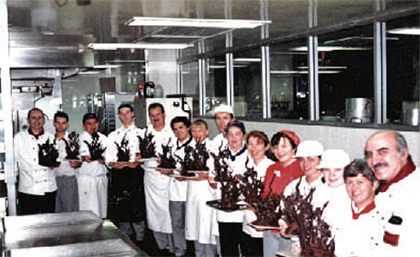 The recording of transfers and staff sales were transacted a few times a day but it left me with lots of free time to observe everything that happened right before my eyes in the pastry kitchen; mass production, fine cake decorating, chocolate dipping and bread baking. After a few days’ hesitation, I stood up and started giving the staff a hand. It was then that I realised that it was much more interesting then just filling out forms. My first month’s salary was 402 Turkish lira and 25 kurus. I gave half of the money I earned to my mum and enjoyed the first feelings of being useful and responsible. My first position as kitchen clerk. 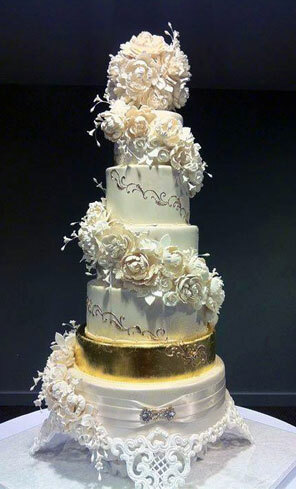 The first wedding cake I ever made. When summer was over and school started again I continued working part-time after the school hours. Priorities changed and school became less important than working in pastry. By then, I was already quite popular amongst the staff and even the managers were requesting me to decorate their cakes. Many of my colleagues were encouraging me to work in the pastry rather than just helping part-time. 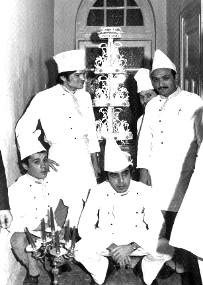 I took up their advice and in 1970; I submitted my application for the pastry cook position to the human resource manager, Avni Diper. I was told to list the things I learned every 20 days and give him a full report. My first report was quite comprehensive as I had one full year’s hands-on experience before. When my school results got worse and the term was finishing, I decided to give up my studies and concentrate on pastry. I then applied for a full-time commis position and knew that pastry will be my life from now on. 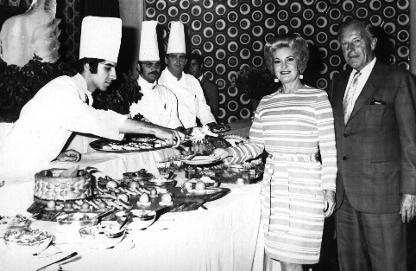 I put in a lot of effort and involved myself fully in all the functions, promotions, banquets and special menus at the five start hotel where I worked. Even without my apprenticeship, I was holding all the key tasks at the pastry and was also trusted by local chefs and expatriate Danish pastry chef Mr Petersons. 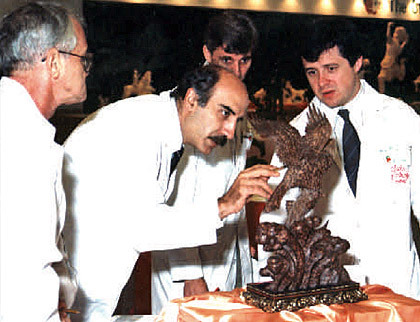 When he left, his successor, a Swiss pastry chef named Peter Straub came on board and we enjoyed working together. 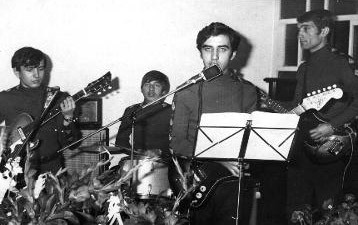 I loved music a lot too and I spent many hours after work rehearsing as lead singer in a band. I worked at a graphic sign shop part-time, and just before I left Hilton, I opened my own photo shop STUDIO 73 for a short period. 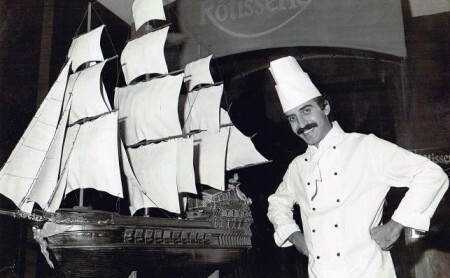 When my first manager Mr Tekin resigned from Hilton and was appointed as Food and Beverage manager at Ankara Palace which was yet to open, he offered me the position of Pastry Chef there and I accepted it without any hesitation. It was a great challenge for me, with only a few years’ experience, I was given the opportunity to lead a team of 10 staff and to organise the opening of a brand new hotel. Performing at a friend’s wedding. 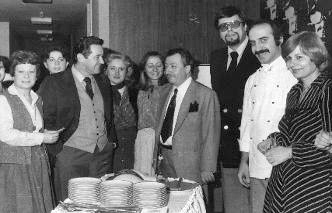 From left: Mr & Mrs Mehmet Binyilldiz, George Usta, myself, Mr Dogan, Mr Bilal, Mrs Tekin, Mr Faruk Atayman and Mr Enis Tekin. For the first time in my life, at the age of 21, many wonderful things were happening to me; so far away from home, being independent, making good money, “boss” of the pastry department and the freedom of work execution. I was young and full of enthusiasm. Ankara Palace’s opening ball was a huge success; with over 40 different varieties of sweets and desserts which my assistant Hakki Pinarbasi (who was also previously working at Istanbul Hilton) and myself had prepared for the last 3 days and 2 nights continuously. 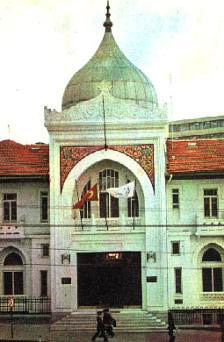 Ankara Palace hotel with its amazing numerous classic arches was built in the early 1900 in the capital city of Ankara. 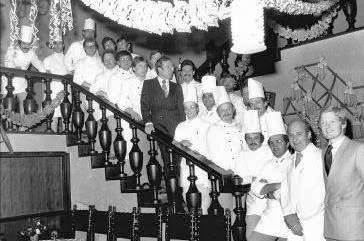 Opened by Ataturk, it was the very first luxurious hotel in the beginning of new Republic of Turkey and the stage of many historic moments. For some reason, it was closed for a while later renovated by Oleyis and opened again to diplomatic clientele. My Chef George Usta (Rauf Soykut) was an 80 year old white Russian and I learned a lot of things from him. 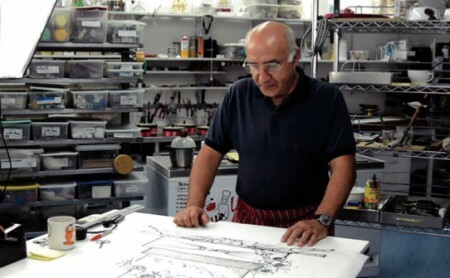 He was like a recipe folder, for he taught me how to manage the most important ability of a pastry chef that is to build recipes instead of collecting them. From those days onwards, ingredients were like the knobs on an equalizer. What happens if one of the knobs gets turned up and another one turned down? 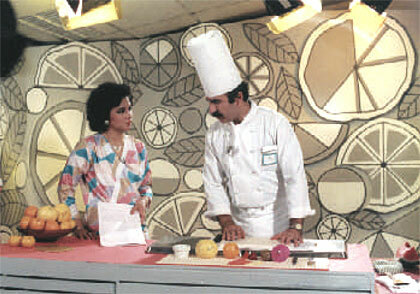 That was the first learning step of composing recipes on paper without actually making them. I really enjoyed working in this very old kitchen. We used to make all those preserves, jam, pickles, etc. After almost two years working and serving many foreign diplomats, I realized that I had to join the military service for 20 months, which was compulsory at the time for every man when he reaches 20 years old in Turkey. I was then almost 23. As usual, it helped to have a profession at a young age. 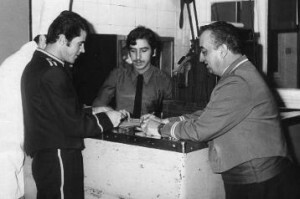 After struggling through the few months’ training, I ended up again in Ankara and was placed in a military house to serve only the hierarchy officers. It was not like a hotel, with no machines nor mixers and everything had to be done with hands. I was lucky to experience this manual work environment to appreciate the future’s technologies. The pastry kitchen was only 12m square and two staff (including myself) had to finish almost 2000 pieces of bakery and pastry items, one to two wedding cakes and 30kg mix cookie everyday. We had to really “work smart and not hard” so that we can still have enough time to go for a walk in Cankaya. Just a few days before my birth certificate was stamped (signifying the end of my military service) I received a letter from my previous General Manager Mr Mehmet Binyildiz. 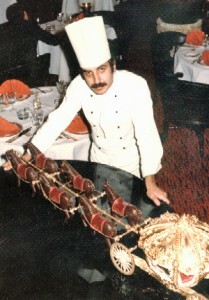 He wrote that he has recommended me to his friend Mr. Taci Tinmaz who was the Food and Beverage manager of Inter- Continental Istanbul. Wow what an opportunity to work in a 5 star hotel again. Finally the traditional count down came to an end and when I was in the bus, I looked back at the memories recorded in my mind the past 20 months and it was just like a quick rewind of a video film. I must say that the days serving in the military service did not pass quickly at all. 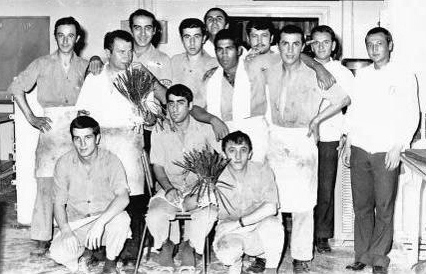 July 1975 – Standing left to right; Ali Ihsan, Husnu Usta, Me, Husamettin, Kemal, Recai, Huseyin Usta, Ali Riza, Cevdet. 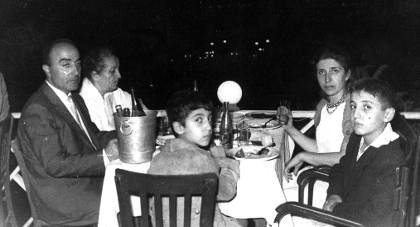 Sitting left to right; Ibrahim Sonmez, Elmaci, Huseyin. Few days later, Mr Tinmaz himself interviewed me and I must admit that the recommendation was quite helpful. In a few minutes, I was given the position of assistant pastry chef. 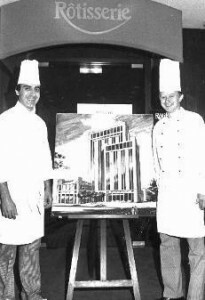 My executive chef was Helmut Helwig and Herr Eisenbeis was the experienced opening pastry chef from Inter-Continental Hanover. I could never forget how he jumped up with joy when he saw my first French pastry platter. We had such a good time together. 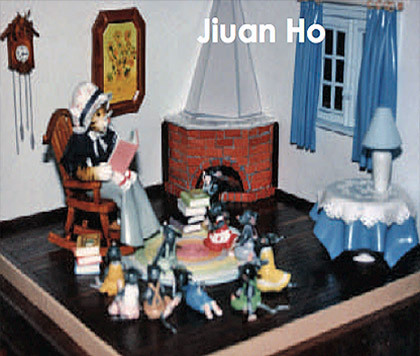 When his contract finished in two months, he went back to Hanover and I was promoted to pastry chef. Shortly after, I entered my first competition at Ikonda Vienna and won my first gold medal. 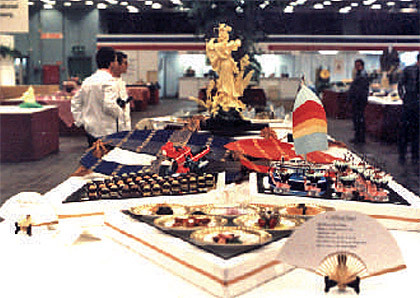 The following year, the management liked the sugar showpiece (a giant model of a hotel which I made for the official opening party) so much that they sent me to Inter-Continental Vienna for two months’ training. 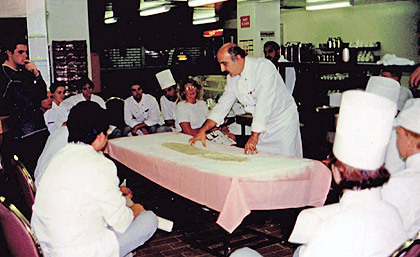 During a strudel demonstration in the lobby. In 1977 my first marriage was to Mine Pere, the daughter of a famous opera singer Nevin Pere. The morning after my wedding, I flew to Vienna for the training. I came back later from the training with lots of new European influenced ideas, and it helped me to upgrade myself and the products we do. In the meantime I was also making small sugar figurines at home with my neighbours’ help. Eventually, this business turned out to be quite lucrative. Birthday party of Food & Beverage Manager Mr. Taci Tinmaz. 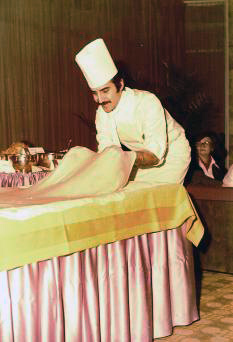 After three successful career years has passed and the 1979 hospitality industry turmoil, which caused endless strikes, I was prepared to move on. Our first child was stillborn and sometime after that, my ex-wife Mine was again pregnant with our son Orcun. My ex mother-in-law believed somehow that the medical facility was much better in Europe and she persuaded us to move. 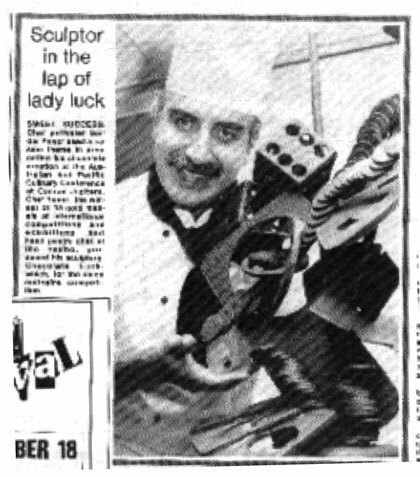 I called Helmut, and he found me a job at Inter-Continental Dusseldorf as pastry chef. A few months later, I received a letter from the German embassy stating “your visa application has been approved”. I considered myself very fortunate for it was not easy that time in Turkey to get a work permit in Germany. It was really interesting to travel over 3000km by bus and see lots of things which I had never had the chance to experience if I were to travel by air. 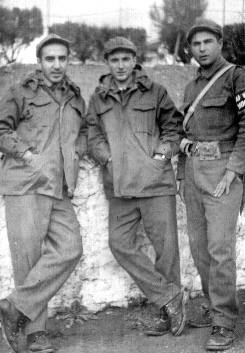 There was no war then, and to travel from Turkey to Germany I had to pass through Bulgaria, Yugoslavia and Austria. When I arrived at the Human Resource office of the Inter-Continental hotel, there was a big surprise waiting for me. 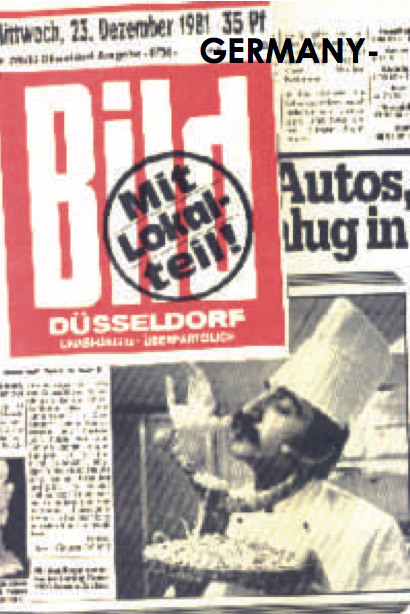 As the official correspondence and red tape matters took too long between the consulates of Germany and Istanbul, they hired another pastry chef. My goodness! I was there, jobless and it was the biggest shock of my life. 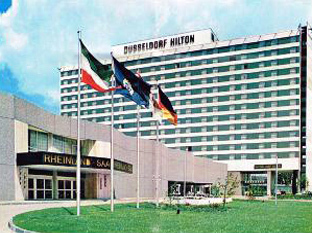 Luckily the Human Resource manager Herr Dossman helped me to start immediately as assistant pastry chef at it’s sister hotel Dusseldorf Hilton. 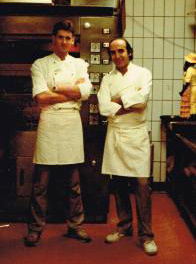 My Executive Chef was Gunther Scherrer and he was the most demanding chef I had ever worked with. 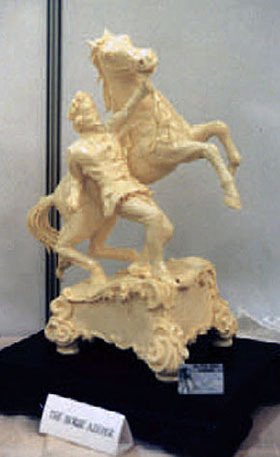 He was so amazed that I was able to finish 7 large butter sculptures in just a few days. The young Pastry Chef Norbert Maushagen left for Canada 3 months later and again I was promoted to Pastry Chef in a short while. My first centerpiece displayed on a grand piano. 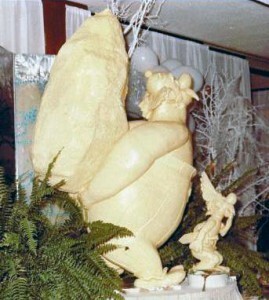 One of my large butter sculpture (Asterix). 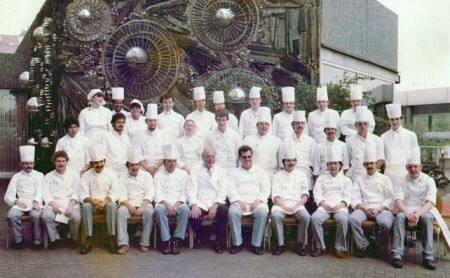 In early 1980 I attended the Pastry Chef seminar in Vienna Hilton and Walter Glocker conducted it. There were 20 Pastry Chefs from all around the world and I must say it was very educating. On the 27th of February 1980, my eldest son Orcun was born and at that time, we were still living in a one-room apartment at the staff lodge. 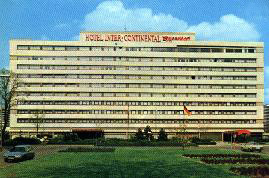 My reputation grew and a year later I started receiving phone calls and letters from Biancalio Corporate of Inter-Continental hotel. Obviously they have regretted sending me to Hilton and requested for me to work for them. For me, it was fair enough as they were the people responsible for getting all the red tape done to enable me to work in Germany. Besides the offer was better and I took the job. 20 Pastry Chefs from around the world gathered in Vienna to attend Walter Glocker’s ( 4th from top) 10 day work shop. 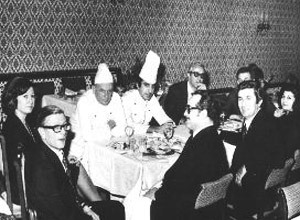 Executive Chef Gunter Scherrer (5th from right) and his crew with famous restaurateur Rudolf Katzenberger (6th from right). This photo was taken during Katzenberger’s one week promotion in San Francisco Restaurant. The first good thing was, we moved from the Hilton staff lodge to a proper 3 bed room house. 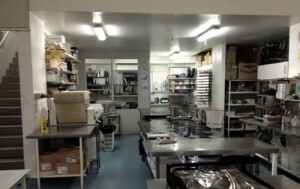 When I started working in the pastry, my Executive Chef was kind enough to let me convert the small storeroom into an office. Shortly after that, I appointed my assistant Achim Mehler and everything went very smooth, for we enjoyed the next few co-operative and creative years together. Achim was part of the exchange program from East Germany when the wall was still there. On the 17th of September 1982 my second son Serkan was born. At that time, I was quite crazy about wines and I attended many wine tasting seminars. 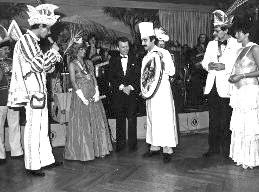 Getting medals from the Carnival Princess was a yearly event. 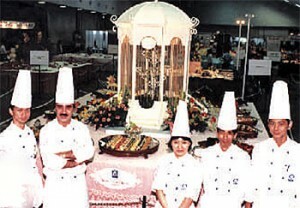 If somebody were to ask me today what was the most exquisite piece I have ever produced, surely I would mention the 3 metre high Japanese sugar pagoda in Mainz for the “sports des ball” event. About 3000 people including the Prime Minister and all the Olympic medallists had to pay 500 German Mark each to support the sports events held in Germany. 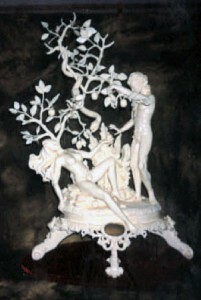 I had been personally invited to produce this piece. I worked 7 days for the 3 minutes presentation. 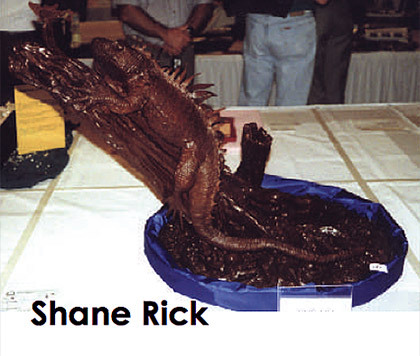 I was very proud when my piece, was paraded in the function room during the desert presentation. I worked 5 full “hands-on” years in this hotel till one fateful day, I received a call from my ex manager of Istanbul Hilton. He asked me to join him for the opening of Pan Pacific Kuala Lumpur in Malaysia. I went to the library to do some research on this beautiful Asian country. 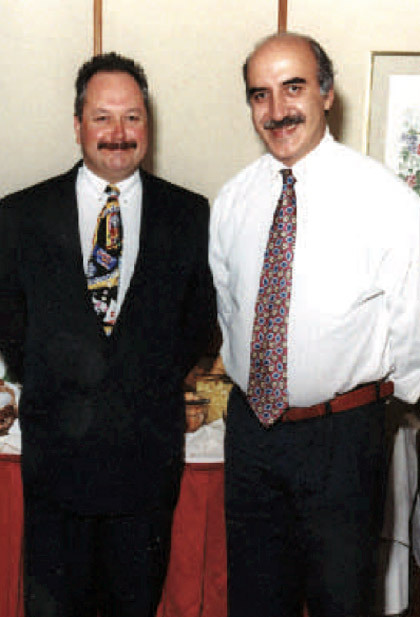 Besides me, a couple of my ex colleagues from Istanbul Hilton, Mr Erhan Bursa as F&B director and Birol Kaymaz financial director, were also going there. I took up the challenge for my second opening and this time, I signed my contract as Executive Pastry Chef for a five stars hotel. 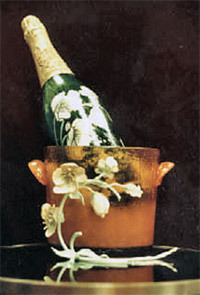 At our farewell party with my good friend Kemal, we opened a bottle of Magnum Perrier Jouet, which was presented to me a short while ago in appreciation for my blown sugar centrepiece of the replica piece, which was exhibited at the Champagne museum in France. That was really a new page in my life. It was a very different feeling; my income has tripled, working first time in Asia as an expatriate. It was raining heavily with thunder when we arrived at Shangri-la Kuala Lumpur hotel. I faced a total culture shock; with totally new life-style, environment, food and people. 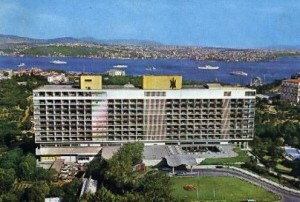 At that time the Pan Pacific hotel was still under construction and thus, myself and the rest of the management staff had to work at the opening office. 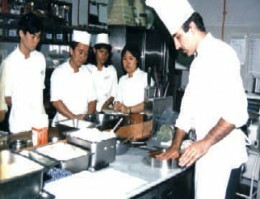 My Executive Chef Werner Meyer was a Swiss with working experience in Asia. He trusted me from the first day and allowed me to work the way I want to be most productive and creative. After three months of preparations, interviews, recruitment and classroom training we took over the hotel. From the first day, I had problems with my English language. Jiuan was a real help to me for she was the only one who understood German and got the message through to the staff. I believed that my staff appreciated that they could learn a few things from me right from the start. I had never worked with such an ambitious team before. 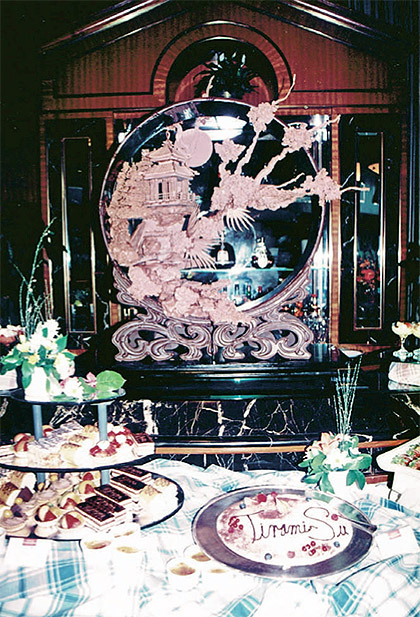 With everybody’s help especially Jiuan’s administrative input we achieved a very high standard and made “La Patisserie” a very popular pastry shop in town. 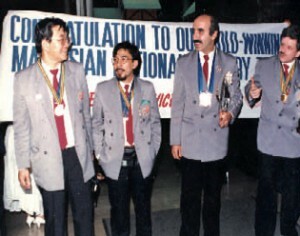 With the numerous competition awards and medals, I was even featured in the TV news, local and overseas newspapers. 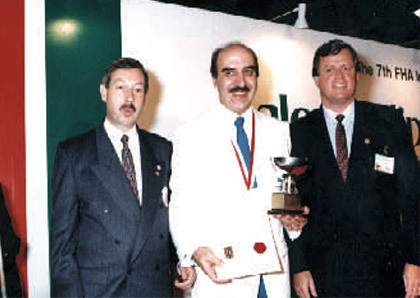 Here was the start of my international career, especially after I have bagged the “Best Artist” award from the Igeho competition in Switzerland. My family also enjoyed our 3 connecting corner suite rooms at the hotel. 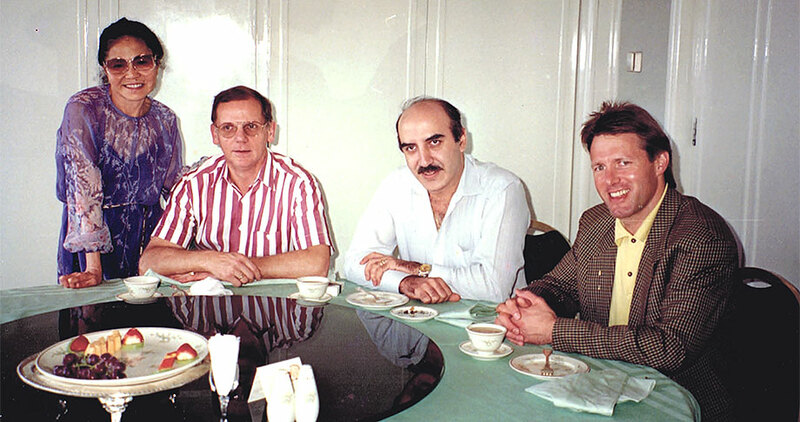 On many occasions I had the opportunity to socialize with the diplomats. 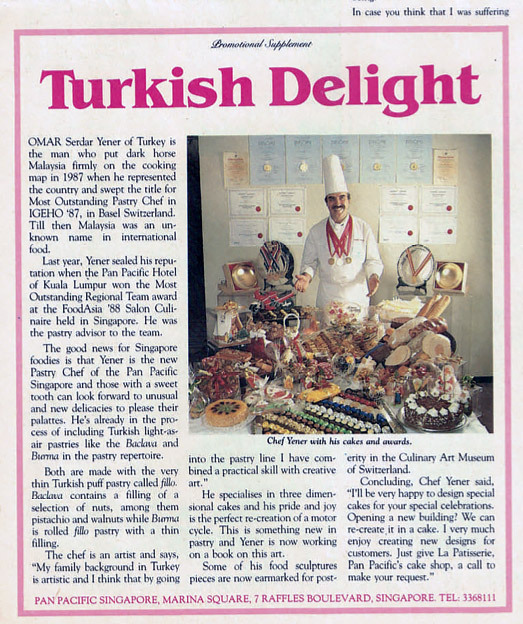 If I were not in Kuala Lumpur, I would never dream of meeting the Turkish President Kemal Evren and present him one of my sugar centerpieces. 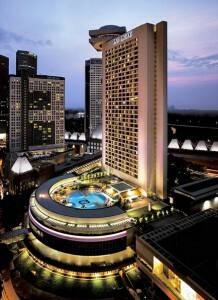 The day came again that I had to move on and I got my transfer to the Pan Pacific Hotel in Singapore. ￼With the Press just before I left for Switzerland. I was giving the details of my competing pieces. A big crowd welcomed us when we arrived at the Subang Airport from Switzerland. 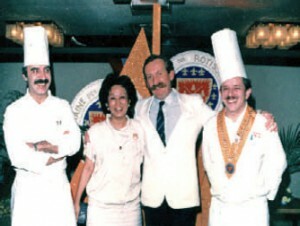 With Chef Meyer and GM Jean Wasser. 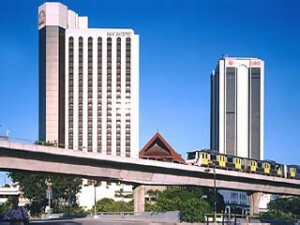 This two year old hotel was located at Marina Square and the General Manager was Mr Jean Wasser, who was also my previous General Manager from Kuala Lumpur. 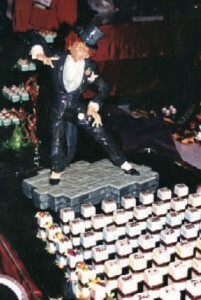 I carried on doing my famous novelty cakes at “La Patisserie”, while competing with all the other hotels to uphold a certain level of pastry standard in Singapore. 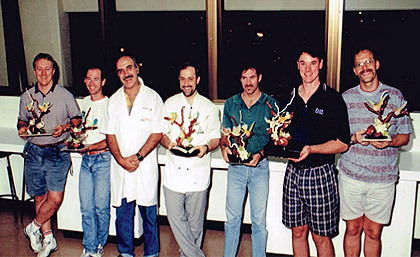 This competition streak was also an “addiction” in Singapore. 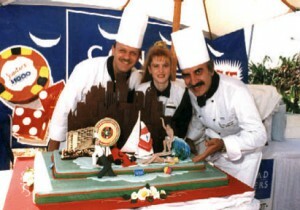 In 1990 I received the best pastry chef award. I decided not to compete any more after I received an invitation to judge in a competition. For the longest time, I had thoughts of opening my own business and with that in mind, I turned down the corporate Pastry Chef position from Hong Kong Hilton. On the 1st. 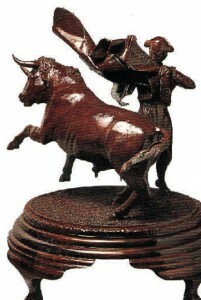 August 1991, I incorporated Yener Pty Ltd with Jiuan as my partner. I felt like I was in the middle of the ocean and I jumped into my small boat from someone else’s cruiser. Mr David Cheong, the owner of Win Sin kindly offered me the classroom space at his premises for conducting my courses and producing special cakes. During Christmas we organised a competition. Whoever guessed the closest weight of the giant Yule Log cake will win a prize. 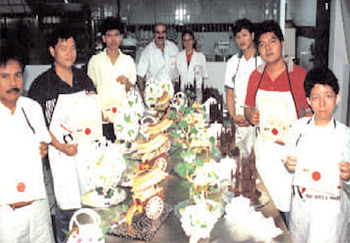 At that time, Win Sin was the main pastry ingredient supplier in Singapore. Mr Cheong spent a few million dollars on his brand new showcase factory which included a perfectly designed comfortable demonstration room to accommodate 12 hands on students at a time. 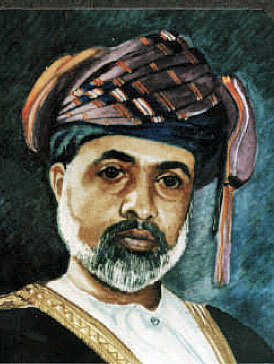 My joint venture with Mr Cheong worked out well and in a short while, my reputation increased and one of my most important clients was the Sultan of Brunei. The students both local and overseas were constantly filling up the classes. I enjoyed working as my own boss for over a year till i decided that it’s better for us to move on to another country where we can settle down for good. Australia was the best option over USA and Canada and I could no longer resist the long pending offer from Hotel Conrad Jupiters on the Gold Coast. 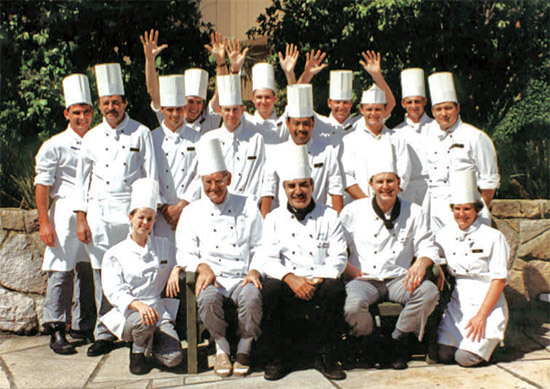 My Executive Chef Gunther Karch sent his Sous Chef Volker Kopke to pick us up from the Brisbane airport on the 21st of December 1992 upon my arrival. On the following day, which was 3 days before Christmas, I started working and it wasn’t easy even though the kitchen was well prepared for the festive event. This giant hotel, operated by Hilton, welcomes on average over seven thousand guests daily. 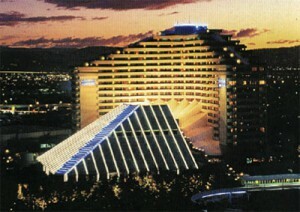 It has 6 restaurants, 1000 sitting banquet capacity plus the largest casino in Queensland. That was the biggest baby I have ever cared for in my entire working experience. Everyday, 20 over staff looked to me and asked, “What do I do now”. That wouldn’t be an easy question to answer if I didn’t have a well-organized kitchen with its proper station delegations and duty rostering system. My first task was to simplify the operation by separating the kitchen’s 5 distinguished stations and to deal with them like individual departments. 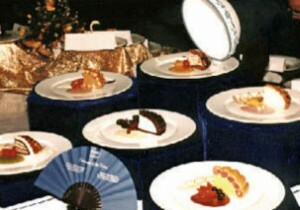 During those 5 years we had hundreds of challenging ideas, menus, events and of course also some “show off” events. 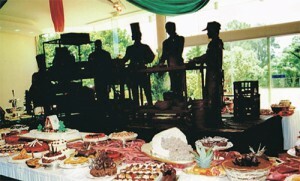 Every one of our X’Mas lunch buffets and chalet sales of Christmas goodies always out sold the previous years. The dessert for the Indy ball where I created chocolate “tyre-like” marks on each plate was one of the ideas, which will never be forgotten. 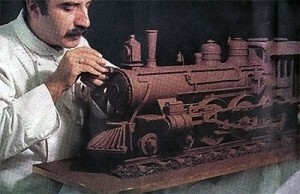 Occasionally I also taught sugar and chocolate art at TAFE College. Years passed and the time came for us to look forward for new challenges. After 8 months of regular home meetings, my assistant Pastry Chef Martin Reisch and myself decided to go into our own business venture. 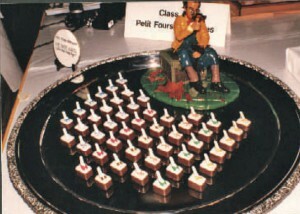 On the 14th of August 1996 we registered our company Yenmart Pastry Art. Surprisingly, Conrad Jupiters management agreed to allow us to continue to work at the hotel. We found a nice front shop in Bundall and for the next 18 months we continued working at Conrad whilst we built our shop from scratch. 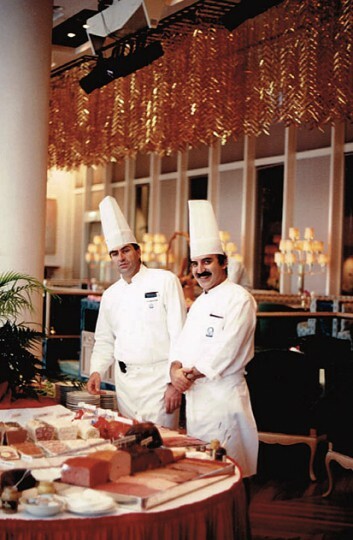 At midnight on the 31st of December 1997 we celebrated our last day of work at Conrad Jupiters and our new venture with bottles of champagne. On the following morning we only had out little shop to worry about. With Executive Chef Gunther Karch. 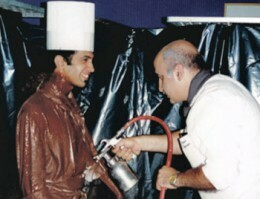 A street performing artist sprayed with chocolate surprised guests when he suddenly moved during a service. 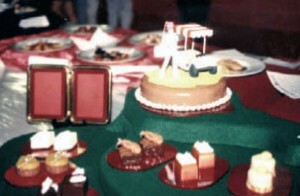 Christmas dessert buffet was presented with a different theme every year. 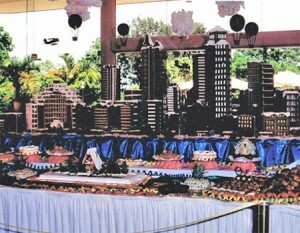 Gold Coast skyline out of Ginger Bread. 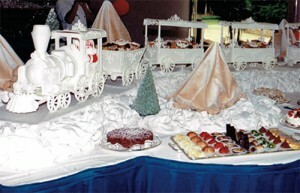 Santa’s sugar train filled with goodies. First shop in Bundall, Southport. Here we go! I was again in a small boat off the shore. Found a beautiful front shop on a busy street in the middle of Bundall. This was a good place to rest ashore. The shop’s front windows were covered with paper whilst we produced more than 45 sample cakes and showpieces with a lot of passion in the kitchen. On Monday the 3rd of March 1997, we took the paper off the windows. 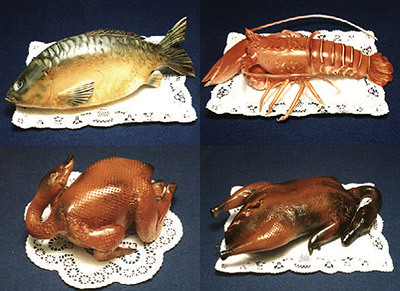 Gold Coast had the pleasure of viewing realistic looking novelty cakes that they had never seen before. 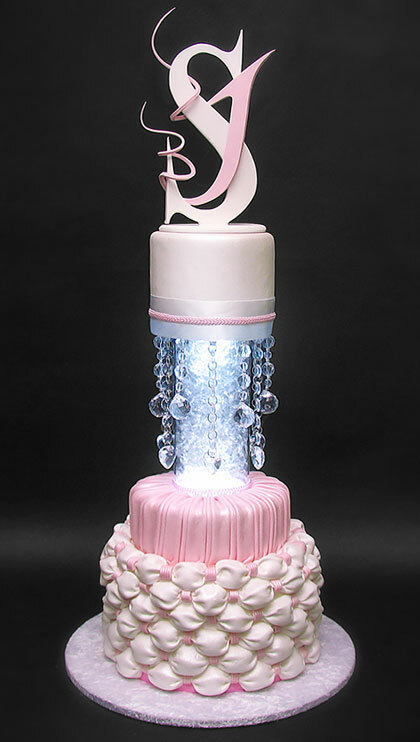 Yenmart Pastry Art’s aim was to deliver a wide range of products from wedding cakes, birthday cakes, table centrepieces and any other custom made designs with a reasonable price and excellent service. We said to our customers “if you can dream it, we can do it”. 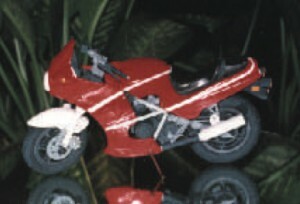 Our product range was limited only by people’s imagination. 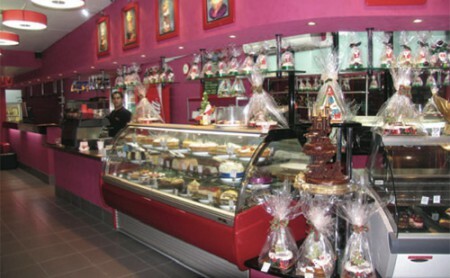 We also produced frozen cakes and desserts made to order for hotels and restaurants. We served our customers for over ten years in this location. 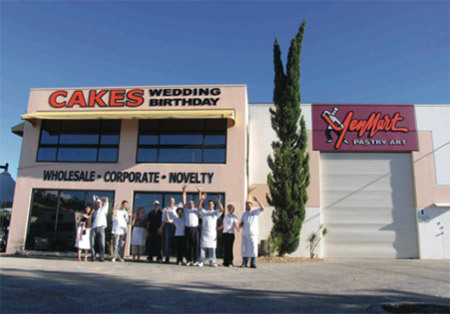 We then moved to Central Dr, Burleigh Heads for production and opened a retail shop at Broadbeach. Standing: Serkan Yener, Martin Reisch, Orcun Yener. 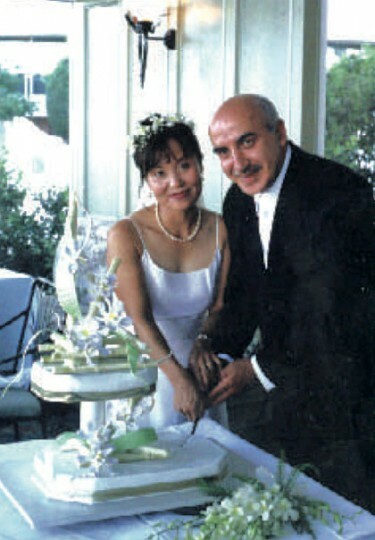 Sitting: Jiuan and Serdar Yener. At the end of our 3 years lease, we moved again to another shop just around the corner at Hutchinson Street, Burleigh Heads. This time we purchased a 400 square naked factory and built everything from scratch according to local council requirements. After 4 and a half years, we decided to close our Broadbeach retail shop. We (Martin & myself) also decided to go our separate ways. Meaning we would operate as two separate companies and continue to work in the same building. My family and I continued our activities as Yeners Cakes. 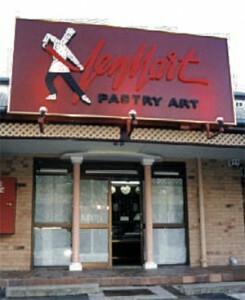 We moved to Hutchinson street early in 2009 as Yenmart Pastry Art. This move would be our final relocation. We started everything from scratch and carefully designed each component of the building accordingly. Thanks to Martin, my family and all our friends, for working so hard during the construction. 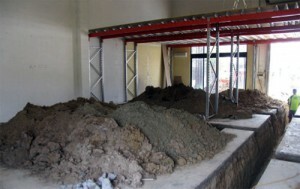 We even built in a second floor with a raised platform which added 140 square working and storing space. 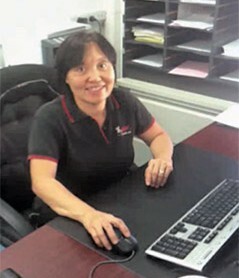 My wife Jiuan in the office. 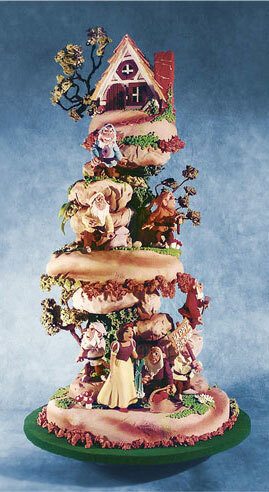 From 2011 July onwards, we were Yeners Cakes and we emphasized more on wedding and novelty cakes. 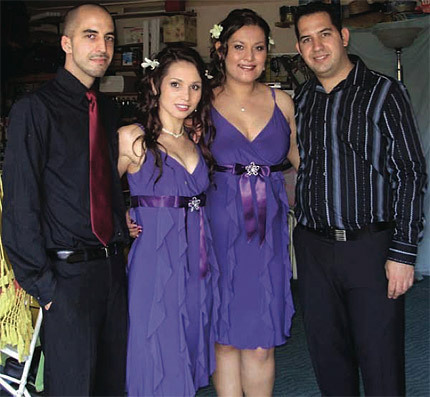 We were involved in almost every Wedding Expo on the Gold Coast and Brisbane. 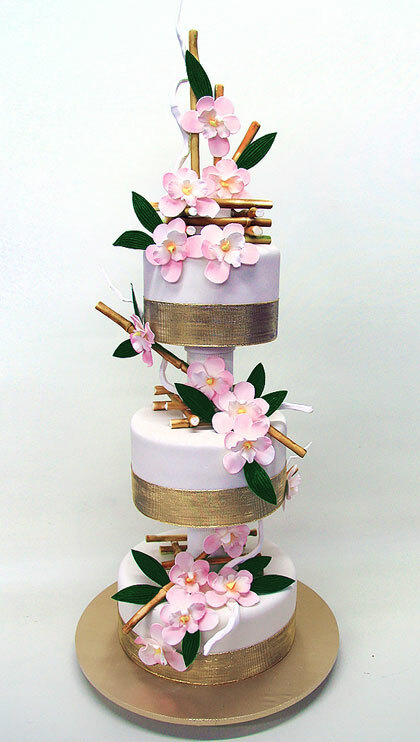 Just like the fashion world, we also had to update ourselves with the latest designs & trends in the wedding cake space. Certain designs that we did and was very popular a few years ago is out of fashion today. Updating ourselves with the help of the internet, an open mind and learning from others became a daily affair. We regularly added new designs to our website and portfolio. Having a good informative website and working on it regularly is a big priority these days. My son Serkan was always interested and involved in IT and made a lot of this possible. On the 1st of April 2014, we launched our new website Yeners Way. 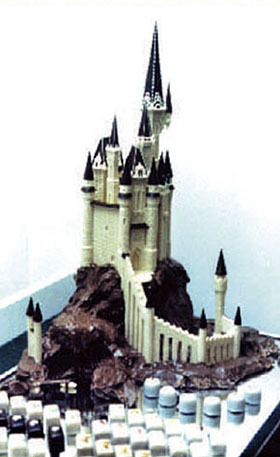 A place for all cake enthusiasts to learn cake decorating or improve their cake decorating skills. Over a year in the making, my son Serkan and I put this website together from scratch to be an ideal platform for us to share and teach cake decorating ideas and techniques that we have been using for years. 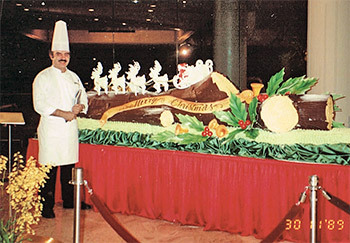 Years of working in international hotel chains, participating and judging in international competitions and primarily producing wedding and birthday cakes for over 15 years in our family business, we have gathered an extensive accumulation of tricks and techniques. I have always had it in the back of my mind to write a book (or books) about all the acquired pastry knowledge in my life. Thanks to today’s information and technology age, I have decided not to go into booking writing just yet but instead, share and impart my knowledge through Yeners Way. With a focus on attention to detail, simple and clear teaching style, downloadable blueprints and templates, our aim is to make learning the art of cake decorating easy and accessible for everyone. 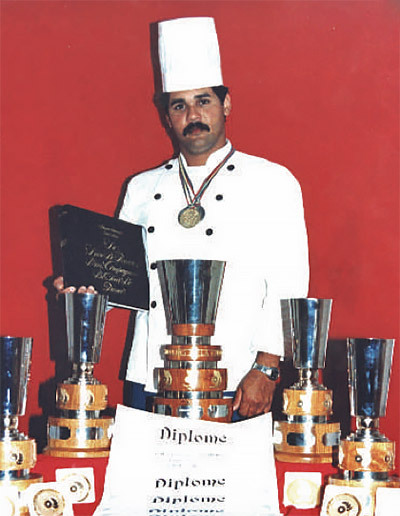 I have competed internationally and won 15 gold medals (most with distinction) at major salon culinary competitions. “Dolmabahce” was my very first piece in the competitions. I shot 72 photos of this huge gate with my zoom objective camera to achieve fine detail and it took me 20 days to make its replica out of sugar. The box, which was used to transport this showpiece, was so big that it couldn’t go into cargo door of the plane. I had to tilt the box side way and it was fortunate that it arrived in one perfect piece. It was a good idea that I had fixed the whole piece on the base of the box. Ten years later I had the opportunity to compete as much as I can. 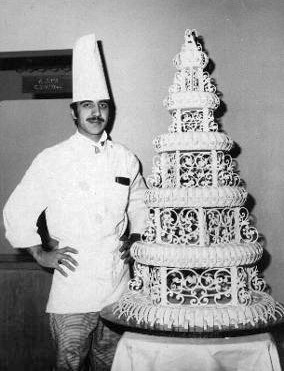 Until today, I still don’t know why my 1930 style wedding cake failed to win any medal in this first day of the competition. 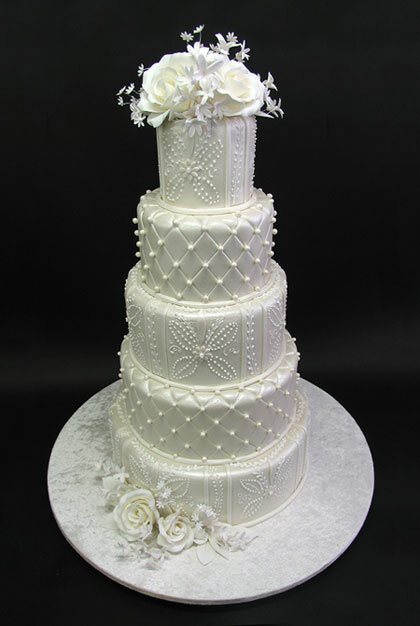 I guess the judges did not appreciate the baroque style, which I’ve adopted for my wedding cake, as they were used to the traditional lace piping styles. 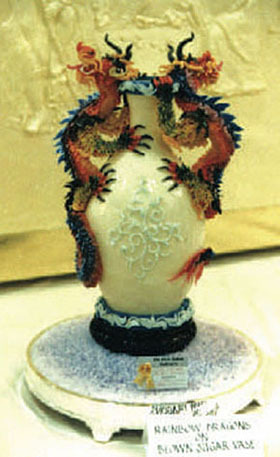 My second gold medal, after all these years, which I had won with the dragon vase entry, brought tears to my eyes. At the Subang Jaya airport, Kuala Lumpur we all looked like a baseball team in our uniforms. 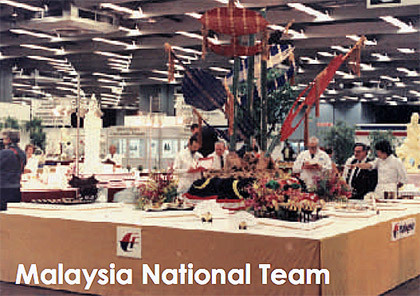 Nevertheless we were just the national team representing Malaysia and we were our way to Basel for the international competition. 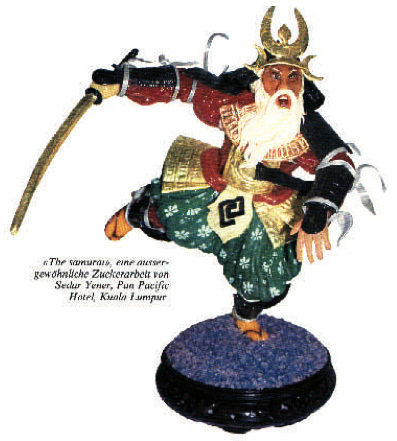 I prepared all my pieces before we left Kuala Lumpur and expected some damages when we arrived there. 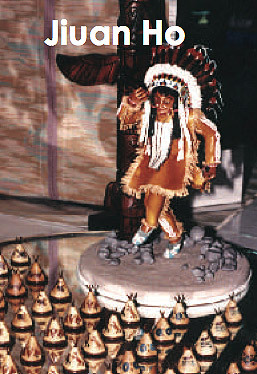 Thank goodness I was able to fix the broken parts of the showpieces at the Basel hotel’s kitchen. Everyone in our team helped each other and we worked through 4 sleepless nights. The talented Pastry Chef S.K. Lim from the Equatorial Hotel also did a very good job in the Regional Team Competition. Competitions became an addiction for me during those years. I had so much self-confidence and for all the three entries, I achieved 40 straight points. I should have joined another pastry entry to win the Most Outstanding Pastry Chef title easily for the 3rd time in my career. I decided to compete for the last time and do the right finale. I aimed to get the Most Outstanding title for the second time. I was the Regional Team captain and tens of other staff was expecting good advice from me. Beside the normal operation of work we all prepared 8 months long for this competition. Monthly meetings and trial runs with the team were quite important. Hard work always pays off and we were ranked third at the Regional Competition. I got my title and the staff I trained bagged most of the gold medals. 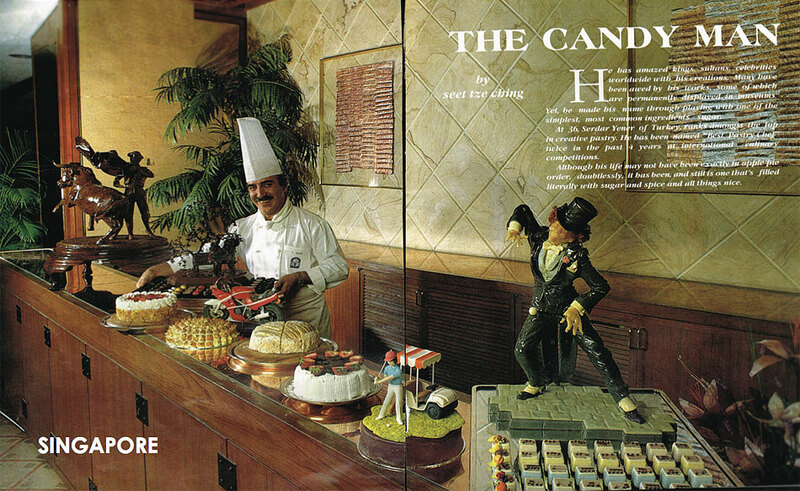 I was named The Candy Man and I guess it’s because they liked my Candy Man Sugar Showpiece very much. After I have received 5 gold Medals for 5 entries I was also awarded with the most outstanding artist title. At the end of the competition, I was asked to display all my entries on a table for the special presentation (left). 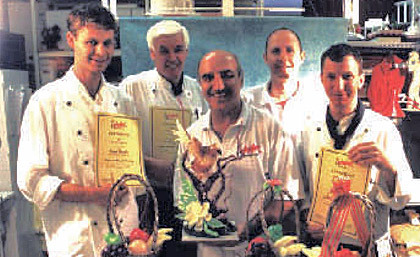 I received my second most outstanding pastry chef award in Singapore from Mr Huuber and Mr Alan Parker (right). 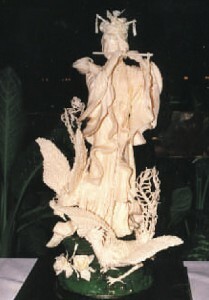 My centrepieces were displayed in museums at Champagne FRANCE, Culinary Art Museum SWITZERLAND and the National Museum SINGAPORE. 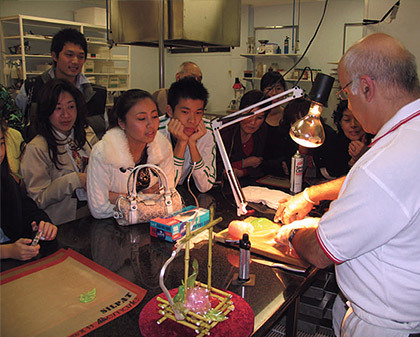 I have trained more than 250 local and overseas students in Singapore. 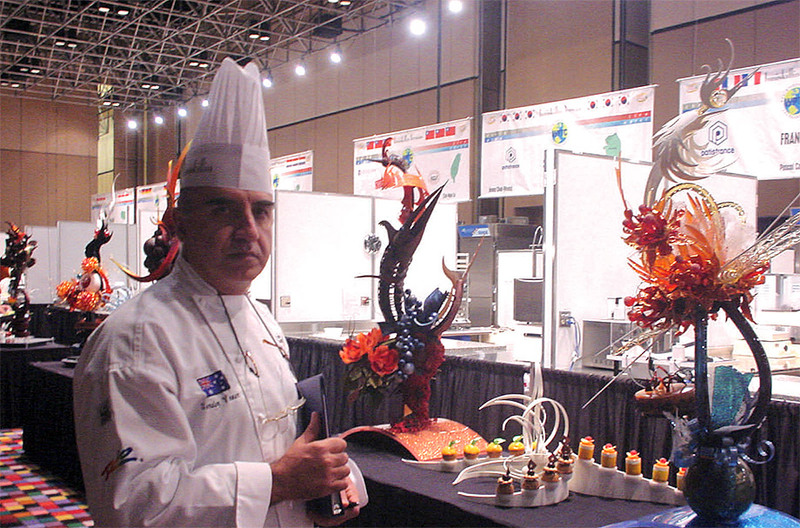 I continue teaching in Australia at Yenmart Pastry Art and TAFE Colleges about sugar, chocolate centrepieces and pastry specialities. 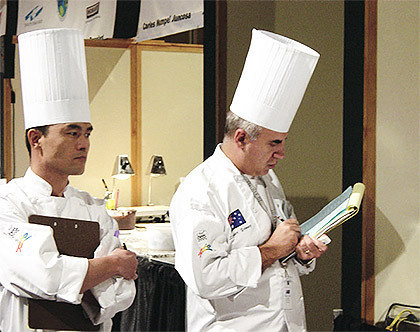 I have judged at major culinary competitions in Malaysia, Singapore, Australia and USA. 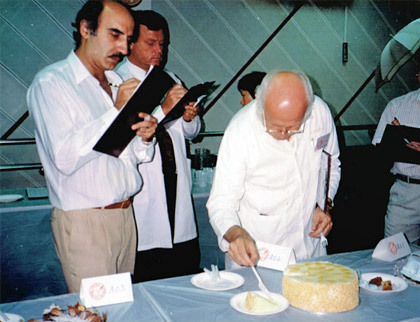 During Prima Cake Competition Judging with Joseph Cavietzel. 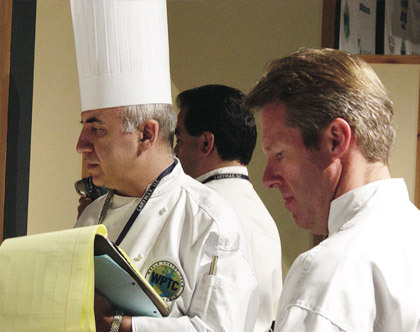 During one of the Singapore Food Asia judging sessions with other pastry chefs Mr. Meyer, Mr. Baumgartner and Mr. Shutzenberger. I was very honoured when Herr Kurt Schintler (Principle of Master School in Koln Germany) and Mr Ewald Notter (World renown sugar artist and owner/founder of International School of Confectionary Arts outside Washington City USA) accepted my dinner invitation. We talked about the olden days in Germany and Switzerland. Mrs Kavietzel (standing) on left. 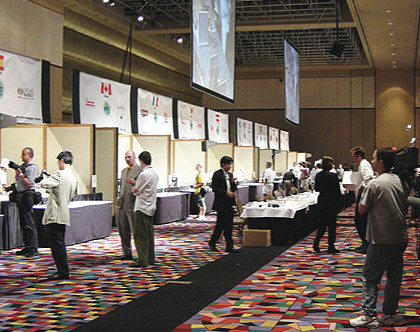 With Japanese Judge Tatsuya Kijima during 2002 World Pastry Championships, Las Vegas. 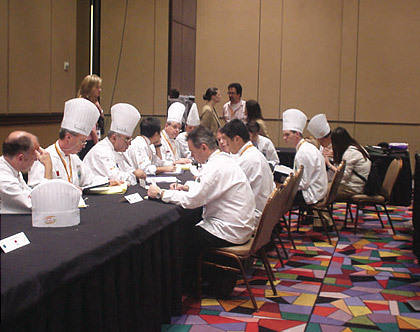 Judging with USA Judge Mr Ewald Notter during 2002 World Pastry Championship Las Vegas. 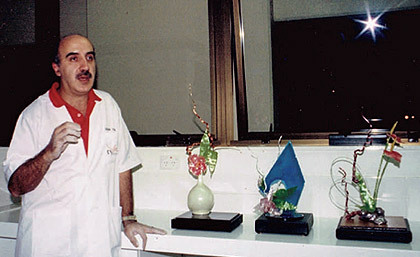 Just before the starting bell – 2002. Judging community solving some conflict issues – 2004. 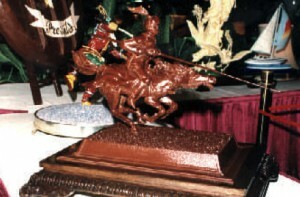 ￼Winning Team USA chocolate and sugar centerpieces 2004 World Pastry Championship, Las Vegas. I have been invited several times to different countries to give seminars and demonstrations about sugar and chocolate work besides constantly being involved giving short seminars at our work place. 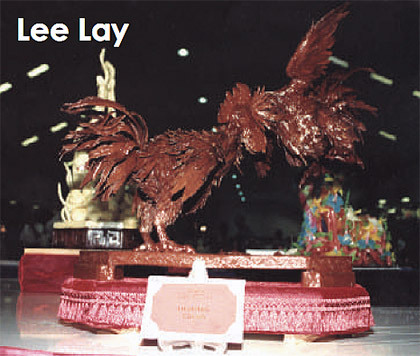 Few of the major one-man shows were at the Hong Kong Hofex, Singapore Food Asia and New Zealand Tour for Nestle. Exhibiting in Food Asia Singapore. 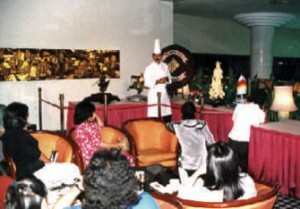 Demonstrating Sugar Work for Chinese Women Association. My Chocolate work for IMF at Hong Kong Hilton. I enjoyed my tour of Auckland, Christchurch and Wellington with Mr Phillip Thousend who was responsible for the 400 attendees in total for the three seminars for Nestle. During my Seminar at BITC Singapore. I enjoyed coaching and encouraged many young pastry chefs, regional and national team members in many international competitions. Some of those colleagues have shown their appreciations more than others. I am proud to present them and their work of art in my pages of memories. 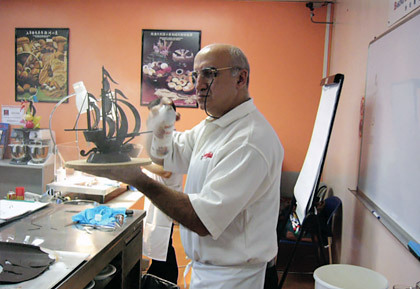 Owner of two pastry shops in Mauritius. He came for work experience at every place I went. 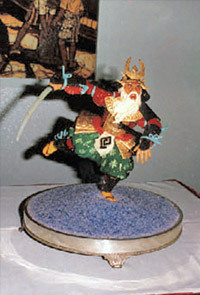 He won the most awards in Mauritius and in Europe. I look forward to his next visit. We worked together in Malaysia and Singapore. Her great passion won her a couple of medals. We will continue to enjoy working together for the rest of our lives as we are now happily married. 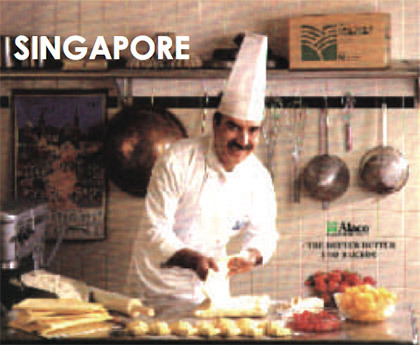 Owner of the largest Pastry Supply company in Singapore. 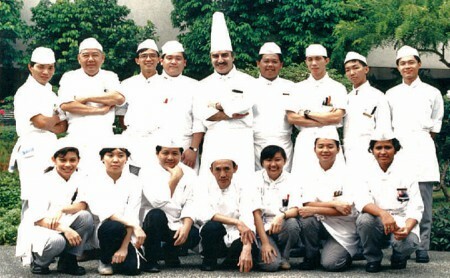 He was my assistant Pastry Chef at the Pan Pacific Hotel, Singapore. We enjoyed consulting each other in many tough competitions. 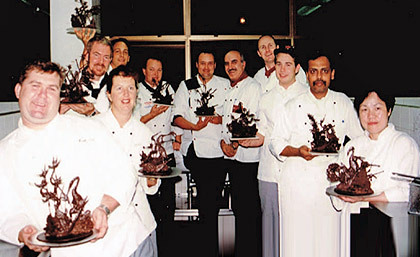 He was recognised as the second Best Pastry Chef in 1990 and awarded the Most Outstanding Pastry Chef in 1992 at the Salon Culinaire, Singapore. One of my most enthusiastic colleagues. 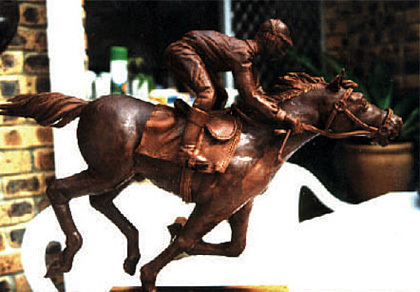 While we were working at Conrad Jupiters, he mastered chocolate modelling in a short time and won many medals at major competitions in Australia. 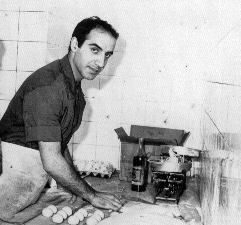 At present, he is running his own Pastry Shop on the Gold Coast. Christian invited us to Mauritius for our honeymoon. He and his wife Bianca spoiled us for 8 days. He gave me an envelope to open in the plane. It was the speech he used at our farewell dinner with his 30 family members. Some of the articles written about my work in international newspapers and publications. I appeared regularly on Malaysian TV (Quali, Good Morning Malaysia, and News) and occasionally on Australian TV, Gold Coast Channels (Wild Life, Great SouthEast and News) and Brisbane show Extra. Australian Tv Program Wild Life. 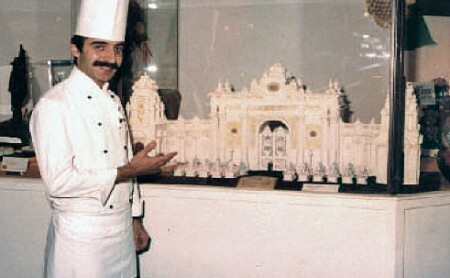 My custom designed cakes and showpieces have been purchased by or presented to many government personalities including the Sultan Of Brunei. 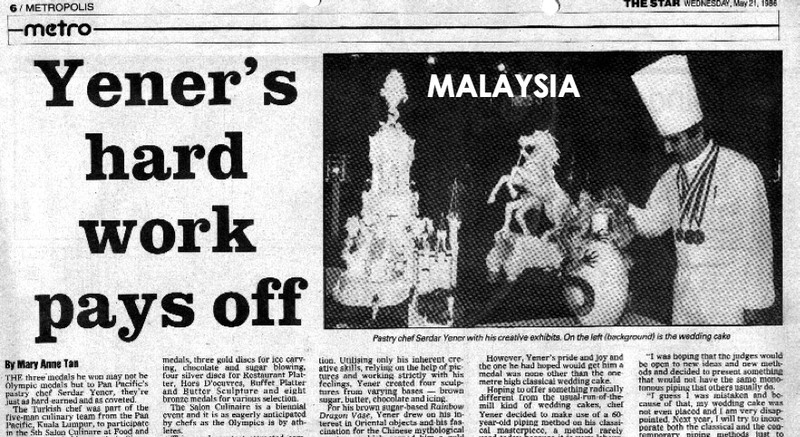 Just before presenting the Malaysian King Iskandar with a helicopter birthday cake. 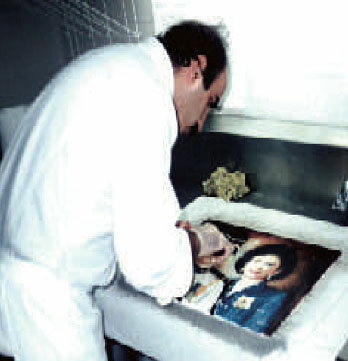 Finishing touches on the sugar picture of the Royal Brunei couple. 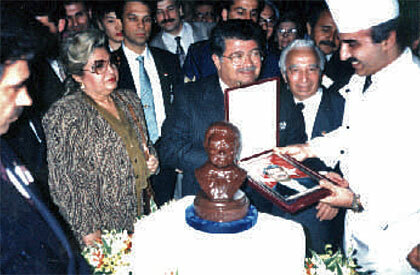 Presenting a chocolate bust of Turkish President Demirel to himself. 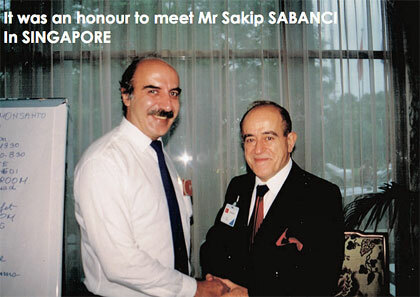 It was an honour to meet Mr Sakip Sabanci in Singapore. 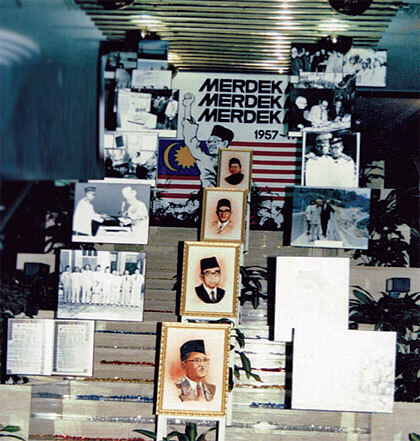 My Cocoa paintings of Malaysian Prime ministers displayed at the Hotel entrance of Pan Pacific Kuala Lumpur. 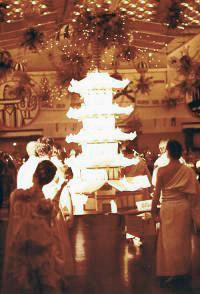 Weddings cakes in classic or contemporary designs. 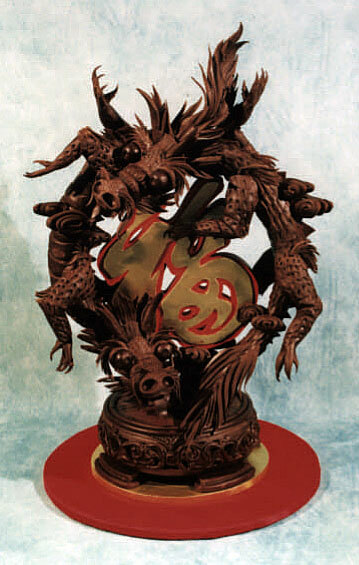 Multiple or single large showpieces out of chocolate, sugar or other edible materials. 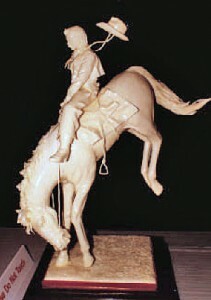 Sculptures with the influence of Western or Eastern cultures. Aquarelle paintings with sugar colours. I was married to Mine in 1977 for 22 years. We both eventually realised that for a long time we did not enjoy any common interests and decided to go our separate ways in 1998. 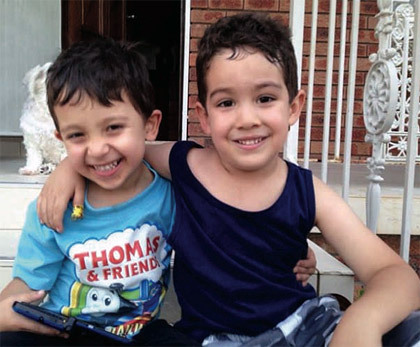 We have two boys’ Orcun (1980) and Serkan (1982). They are now both married and have given us 4 Grand children. On the 1st August 1999, I married with Jiuan and today we are happy working long hours and going out fishing together if there’s any time left. I believe everybody comes to this wonderful place without any agenda. Shortly after family, social, economical, political, religious, educational and many other factors combined, it places a long task list in front of us. We follow that list and achieved some sort of success or struggle for the rest of our life. Luck only adds some small vibrations to that circle. BORN, PLAY, GROW, LEARN, EARN, ENJOY, SHARE and TEACH before we go. If you think about the question “what you think about your future?”, it all depends on which part of your life you’ve been asked this question. For example if you ask that to a toddler he will say “I want to GROW”. If you ask a student he will say “I would like to EARN something”. This will carry on like that at all the stages of life and the answer will be related to the next part of the agenda. I’ll ask myself this question today as I’m ENJOYing my life. It is time for me to SHARE and impart my experience & knowledge with others. For the rest of my life, I will seriously concentrate on Yeners Way. I will do my best to produce regular videos, tutorials and courses with educational value while promptly being available to answer any questions people might have about pastry. All in the hope to help and TEACH as many people as I can. I would also love to travel to conduct demonstrations and workshops around the world as well as write a book or two. This is the plan I have for the future. WOW!!!!…. you really are an inspiration!!!! you have been in this business ten years before i was invented. What can one do to have you as a mentor…..Online mentor…because am worlds away. Thank you sir. It has been such a pleasure to learn from such a noted person. The internet has allowed us to learn from one of the greatest chefs in the world.. thank you so much!! You are truly an inspiration, you’ve had an amazing life. Thank you for sharing it with the world. Merhaba Serdar abi haddim değil biliyorum ama, gerçekten bravo! I love listening to every word you say! You make everything seem so easy and achievable! t is so nice that you use everyday things in your tutorials and don’t need expensive molds I hope that one day you would teach a class in Canada I would love to watch you work in person I enjoyed your autobiography Congratulations on all your wonderful achievements! Вы большой человек и с большой буквы . Сколько Вы прошли , прежде чем почувствовать наслаждение и умиротворение от жизни !!! Я незная английского языка , но смотря Ваши видео , благодаря тому , что Вы все подробно показываете , понимаю все процессы приготовления того или иного блюда . Хочу сказать Вам большое спасибо за Ваши труды, за Ваше подробное обучение, и преклоняюсь перед Вами . Большое вам спасибо за вашу доброту, и я желаю вам всего наилучшего. Really and truly an inspiring man. Greatness comes in sharing and inspiring others. I have found your tutorials very challenging and inspiring. What looked impossible at first was achievable with your detailed demonstrations. You have made me feel that I too can climb that high mountain. Please keep sharing and inspiring us all. Your life story is awe inspiring. So rich, entertaining yet teaching. More than ever before, I feel motivated to making the most out of my passion for cake decorating. Looking foward to learning more from you. Thank you Camille for your kind words. What an amazing journey you have had so far. Congratulations on following your passion and never giving up no matter how hard it must have been at times both profesionaly and personaly. I am honored of the opportunity to learn from you. You are most defnitely one of the greatest artists out there and an inspiration to us all. Thank you for sharing your knowledge, I am deeply grateful. Thank you for your very motivating comments. I wish you all the best. If there is any question, I am ready to help. I’m amazed and in awe at how immensely talented you are in so many areas. I have many of your videos because you are such a great teacher. You know how to reach anyone, where they are, at any skill level. I’m always looking forward to new tutorials you have decided to teach. I am so happy I came across your site while researching on the internet. You are an amazing man who has been given many gifts. Thank you for all that you do ! Thanks Armi for your very motivating comments. I am immensely humbled by your talent and experience. You are truly a master of your art. I would be extremely grateful to gain only a fraction of your ability. For those of us who desire to expand our creativity, ability and knowledge. I want to join them thank you for offering these tutorials. 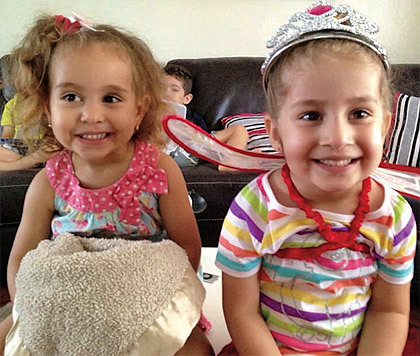 I will do my best to apply the same time and effort you did in making them to my dedication to learning from them. Again, thank you Sir and may God continue to bless you. Thank you for your time to write such a wonderful comment. Wellcome to YenersWay and enjoy your experience with us. Your biography is truly insperational. I found so many things that I can relate to. Everything you create is atrie work of art. 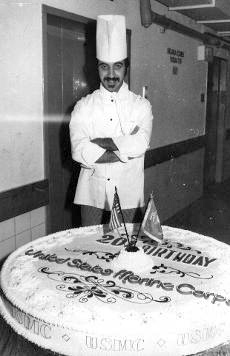 I especially liked the Marines birthday cake. My son is a Marine. I love the Santa candy train. I tried to make one for my family one Chrisymas. I love to bake and decorate. I would lile the opportunity to take your classes and make beautiful cakes like you. It would be an honor to learn from a master. I have not taken any clases. I’ve done mostly from my head and heart. From my heart I say you are the best I have seen. Thank you for sharing with us. Thank you very much. Happy learning and God bless. 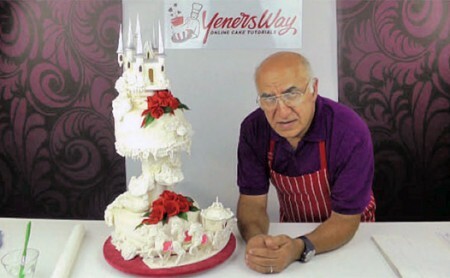 Yener, You are a true inspiration. Those words I do not give out lightly 🙂 I discovered my cake decorating/baking talent later in life. I don’t have the funds to attend culinary school and your online videos are one source I use to enrich my knowledge of both. I have never been disappointed. I live in a small town and with your classes I am always able to amaze them. Knowledge is power. I enjoyed reading your biography. 🙂 Thanks for all you share and teach. Looking forward to hopefully many more. Mr.Serdar ,thank you for sharing your talant and knowledge,I enjoy watching the videos and the way you explain every step in details,you have a gift from god. I found this autobiography fascinating, what a wonderful full life you have had, thank you for sharing your past and your future with us. I only came across your website recently ( I wish it had been much sooner) when I received a request to make doves for a Christmas party cake. I have to say, with your tutorial it was so much easier than I anticipated and my client was over the moon happy with her cake! You bring so much knowledge to the table and the internet, I am so looking forward to being part of your next chapter! Su trabajo y su bografia han sido de grande inspiración para mi, soy mexicana de 36 años. Toda mi mi vida trabaje con cosas que no me gustaban (sistemas computacionales), pero siempre fui buena para dibujar, siempre vivi inquita porque sabia que no estaba haciendo lo que habia nacido para hacer, pensaba, naci para el diseño, para dibujar. hace 7 años me case con un brasileño y me vine a vivr aqui a Brasil y la inquitud se volvio una seguridad que tenia que hacer algo diferente y descubri la resposteria que paso de ser un hobi a un sueño de profesional. Estaba indecisa entre seguir hacer un estudio como diseñador grafico o reposteria. Pero ahora que vi su trabajo me inspiro y se que es reposteria. Nunca habia visto nada parecido o siquiera semenjante a su trabajo, estoy encantada y puedo decirle que desde hoy en adelante usted es mi punto de preferencia y soy admiradora fiel de su trabajo pues considero que es uno de los mejores del mundo sin duda. Pienso que todavia he de viajar y conocer su empresa y poder estrechar su mano. Muchas gracias por su trabajo y compartirlo para todos. reciba mis más sinceros saludos desde una mexicana desde Brasil. Dear Delicia I read your story few times and admire your passion for willing to communicate with art and willing to help who is in need . It does’n matter your grand mother or complit stranger.This world would be a lot better place with more people like you. Thank you for your kindness and your time to write so much to make me motivated. You done that so well. I wish you health very first and all the thing you dream for. I found this autobiography absolutely fascinating, thank you for sharing with us. I only came across your website a short while ago ( I wish it had been much sooner) and I have learnt so much already. The very first tutorial I watched opened my mind to so many possibilities and gave me lots of tips that I am sure I would not have found without your help. I only make cakes for friends and family but I am sure that with your tutorials even my amateurish efforts will improve and I will be able to present even better cakes in the future. Thanks again. Thanks Wendy I wish you good luck. Please ask when you need more info. Well, with your guidance, I could be as good. 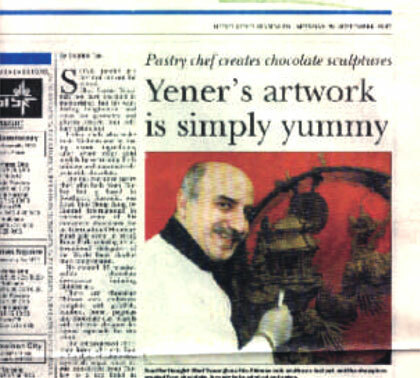 Chef Yener, You’re a great personality!!! Thanks a lot for all you do! Mersi Nora for you your compliments. I am starting my next tutorial this week “la tour Eiffel” I hope you enjoy that too. Ohhhh Chef, it,s a really honnor for us, all the french people, and specially for me to see your project futur of The Eiffel Tower… I’m so glad and i have for you a great honnor and i bless the day when i saw for the first time you website.. Tank you for sharing your passion for cake decorating. You are amazing!!!! I want to be like you …. or at least try … there can only be one Yener I guess. I have been off the cake circuit for a while (my catering takes up most of my time). But, this past weekend I did a 3-d Spider man cake for my friend’s son birthday and everyone “wowed”. I have been tasked (or at least think about it) to do a Harley Davidson cake. Not sure if I want to tackle this task, but I started researching and voila, came across your site. 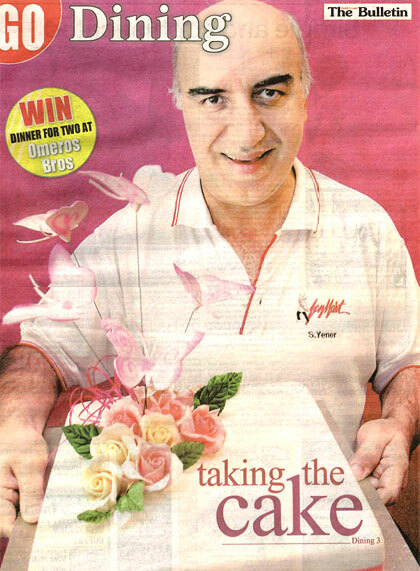 Thank you for sharing your love and passion for cake decorating. Its making me want to go back to cake decorating! PS: will you at least consider doing a tutorial on the Harley? Wow, if only I can get to be as good as 1/10 of you. Right now I work full time and bake when I get orders. My ultimate desire is to open a shop some day and for this purpose I am investing in learning as much as i can but I know I can’t learn it all. I have watched a couple of of videos and I must say I admire your style and am learning so much. I am in awe of you and truly appreciate you.